As the holidays approach, many Shutter Guy customers here in Charleston yearn to update their homes to get them guest-ready. One great way to do that is with new window fashions. 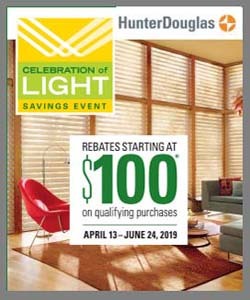 And luckily, now is a fantastic time to buy, because Hunter Douglas—the leader in affordable window treatment solutions—is offering rebates on some of their most popular styles. For full details and to see the products in person, contact one of our specialists today. If you’re interested in Vignette® Modern Roman Shades, Sonnette™ Cellular Roller Shades, Pirouette® Shadings, Silhouette® Shadings, Luminette® Privacy Sheers, or Duette® Honeycomb Shades, you’re in luck. Right now through December 10, 2018, all you have to do is purchase the required minimum of your chosen product to earn a $100 rebate. Plus, if you purchase additional units, you can earn additional incremental rebates. Within four weeks of processing and approving your rewards claim, Hunter Douglas will mail you the appropriate rebate in the form of a prepaid rewards card. Additional restrictions could apply, so be sure to speak with a representative for full details. Sonnette™ Cellular Roller Shades. (Buy 4 units to earn a $100 rebate; earn a $25 rebate for each additional unit.) Sonnette gently diffuses light through an innovative, curved shape. Available in 48 colors (from whites to brights) and in semi-opaque and room-darkening opacities, Sonnette Cellular Roller Shades will enhance any space. It’s no wonder it was the winner of the 2017 WCMA Product of the Year Award!